Binita Manki resides in Phan Toli, which is located in Ranchi district of Jharkhand. She lost her parents in her childhood. She has two brothers. Her uncle took care of them from childhood. They faces many hard time in-between. Her uncle encourages her to do her schooling but after completion of 10th standard, she could not be able to continue because of financial condition of the family. She wanted to do something for her brothers and herself. Binita set an aim which she wants to achieve. She was searching for an opportunity. Her school teacher informs her about Bosco Tech (Kokar). 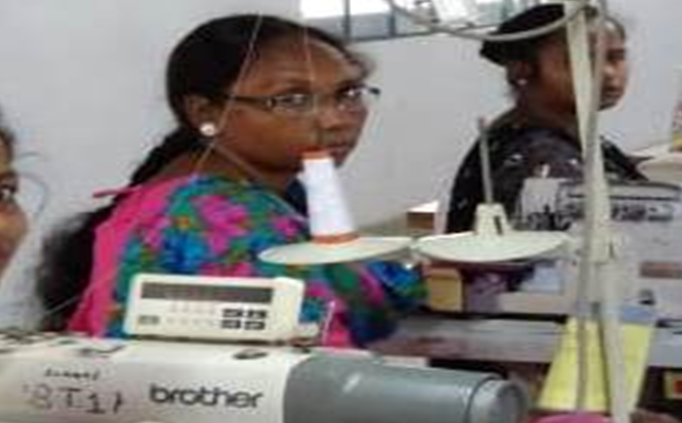 Binita came to the centre to know more about the program and its entitlements. The trainers explained her about the skill development program, which is specially designed to enhance skills for the deprived and disadvantaged youth. After counseling, she enrolled in the Swing Machine Operator course as per her interest. She was shy and reserved in beginning but later she starts interacting with others. She shared her feelings with Don Bosco Tech’s trainer that she wants to support her younger brothers and make their life a better one. Trainers guide her or helped her in every aspect. After the training, Don Bosco Tech provides her chance to interview with Sipcot Industrial Growth Centre. On 4th November 2018, she went to Tiruppur for the placement and performed very well and also got selected in the interview. She joined her duty on 8th November 2018. Now she is financially independent to fulfill her basic needs and also supporting her brothers. She is an inspiration for her friends too.